Planning on being in town the night before the race? Stop by the Cadillac Commons in downtown Cadillac right behind Clam Lake Beer Company on Friday Night between 6 and 8 pm to pick up your race packet and any merchandise you may have pre-ordered. Enjoy a cold brew and a good meal at Clam Lake! Before the race starts, enjoy some of the finest donuts Cadillac has to offer from Blue Heron Bakery! After the races, G&D Pizza will be available for ALL racers! A huge shout out to both Blue Heron and G&D for helping out! McLain's Cycle and Fitness will be on site race day with their wrenchers ready to address any last minute needs you may need taken care of on your bike before you start! 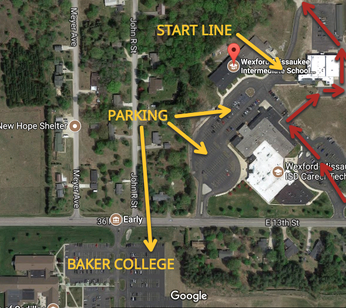 McLain's Cycle is located conveniently close to the race course and is open until 6:00pm on Friday before the race! *All times are approximate and subject to change. Wave times are approximate. Race directors reserve the right to combine waves due to category entry numbers where applicable.